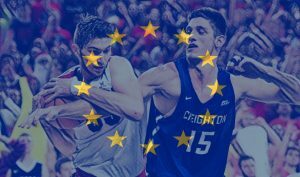 Serbian players are by far the largest group of Europeans in college basketball, so it’s not very hard to find talented and impactful athletes among them. We talked about some of them with Miloš Vujaković, a basketball coach at KK Mladost Zemun and HOOPSpects‘ Director of Scouting, someone who knows these players really well and that is also very passionate about college hoops in general. Nick Rakočević is definitely a POY candidate in the Pac-12. He has been really impressive: many expected him to have an impact this year but not of this proportions, almost averaging a double double (16 PPG and 9.9 RPG). He has so many great weapons: quick, nice footwork in the low post, great timing and decision-making when rolling from screens. What’s your general impression about him? Did you expect this kind of impact? Miloš Vujaković – It’s really hard to predict how a player can improve year by year. I can say that I expected an improvement but maybe not this much. What I like about him is that if you look at his stats from his freshman year to his junior year now, he made improvements every year. Of course, this year his FG% is lower but that’s because his taking 5-6 more shots per game. Also, one of the most important things in his improvement is the FT% because now is at 70%. That’s really important, especially for a big man like him who is always in the post, who is mobile, who can get to the rim: it’s important not to be a liability for his team when he’s going to the free throw line, otherwise the opponents would adjust and try to foul him a lot. He already played with the U20 National Team and I hope he will play with the senior NT in the future. I’m really happy for him and I think that he can be a very good professional player, either in the US or in Europe: his future is definitely bright. It’s just because of his aggressiveness. It’s really hard to play in the way he does without fouls, especially in that age group. With the time and the experience he will learn how to channel that aggressiveness better. I think it’s just part of his approach and style. One couldn’t help but notice that he’s very skinny. For example, if we compare him with another Serbian player, Nikola Popović, we can see that there’s about a 40 lbs (18 kg) difference between the two even though they’re both 6-foot-11 guys. In cases like this, one wonders if the player should simply hit the gym and put some muscles or if that would end up by messing with his game. That’s a great question and I’m not sure I really have an answer to that, not just for his case but in general. The question always is: would the strength program – weights and stuff like that – limit his quickness? I’m not sure about Rakočević but I think that, in time, he will have to improve that: it’s just a question of how much focus should he put on that. 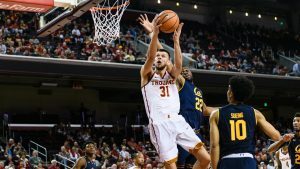 There’s a guy who reminds me of him, a Serbian guy who also played at USC, Nikola Jovanović. He looked similar to him when he was in college. He was skinnier, had the same height, his game is pretty similar, also both of them are not really great shooters so they’re not stretch options on offense. He went that way, he gained a lot of strength, put on a lot of weight and it didn’t work as well for him as someone would hope so because he lost a little bit of his quickness. I think that Rakočević’s future is at the center position: right now, his strength lies in his quickness, compared to other guys. In this modern game, you can play at the 5 if you’re skinny but also are quick enough and have good instincts with the ball. I think that a medium approach would work for him: to work on his strength, his muscles but without going too far with that in order to not loose his quickness. Let’s talk about Nik Popović. He’s having a great season at Boston College and making quite of a jump between his sophomore and junior year. He’s a smart low post player, can use both hands around the basket, has a killer mid-range jumper. On the other hand, he’s probably never going to expand his shooting range properly: at Duke, it was the first time in his whole career that he made two 3s in the same game but, in general, he always had low percentages with very few attempts. Maybe we should point out that it’s really important to look at professional basketball right now and to see what the trends are. So when you look at a guy like Popović, maybe in the past would’ve been more realistic to go to the 4, maybe find someone to work with and start shooting 3s more consistently. But right now, as you can see, a lot of guys who play the 5 are like 6-8 or 6-9. For guys who are 6-10 or so it’s hard to play the 4 if their shot it’s not 35-40% from the 3-point line. I think that Popović is one of those guys that are going to play the 5, his mid-range game will serve him well, especially on short rolls after the pick and roll. You never know, maybe he could get that 3-point shot sometime, but I think he should concentrate on his low post and mid range game to be successful in professional basketball. 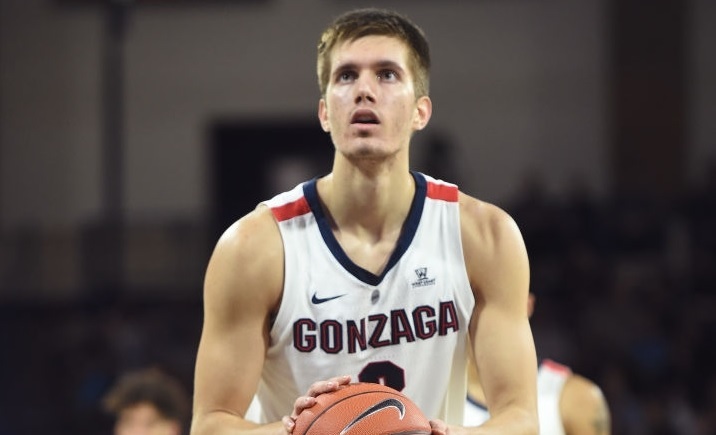 Sasha Stefanović is an American-born player with Serbian heritage that got into the Federation’s radar since that training camp in Denver in 2017, just like Rakočević. 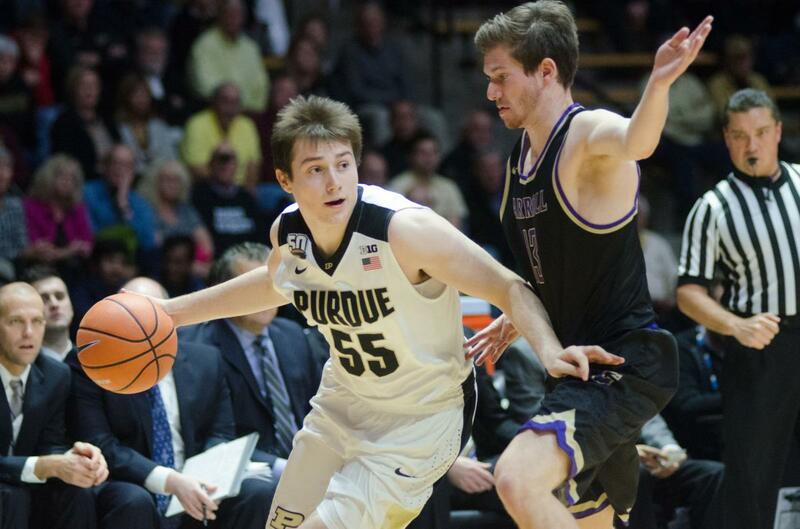 He’s a freshman at Purdue and honestly it’s not that easy to predict what kind of player he could became, since he’s mostly showcasing his shooting abilities during the few minutes he has. Yes, right now he gets his playing time by being a stretch option on the floor, by being that guy who will make a smart pass here and there just to extend the possession. His role will expand in the next two year. He’s a project player, he’s not anywhere near his peak, especially because he plays in such a great conference, every game is hard and physical, he’s not yet at that stage where he can fight those guys with ease. He’s going to be a shooter, no question about it: I like his quick trigger, I think it’s amazing and that’s really important, especially for the next level. He reminds me a little bit of Jaycee Carroll, for the way he shoots the ball. Speaking of freshmen, there’s so much to like about Filip Petrušev, he has shown some really interesting stuff this year, even against the top competition at the D-I level (that Duke game in November, for example). Is this the kind of year that you expected from him? It’s exactly what I expected: playing 10-15 minutes per game, showing some flashes against better competition. He also has shown that he has to improve in certain aspects of the game. I think he will improve, this is a great freshman year for him because he plays on a very, very good team. 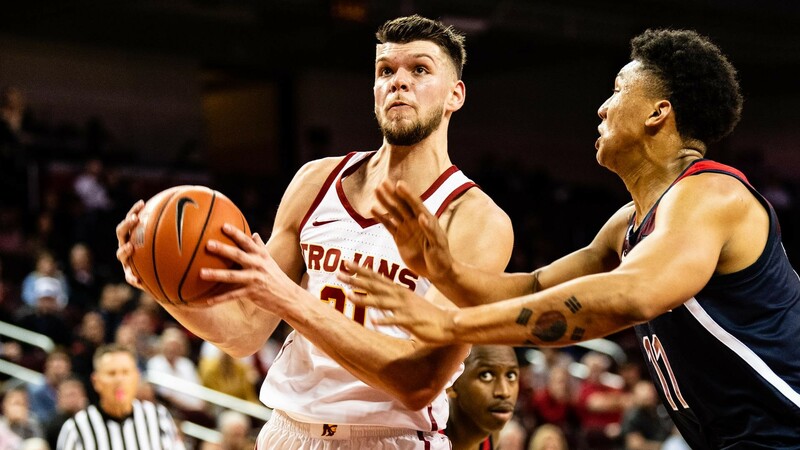 I really believe that next year and the year after that we will see an improvement similar to Rakočević at USC, where he will become one of the best big men in college basketball. So far we spoke only about guys in high major team but there are so many valuable Serbian players at the mid-major level. Vasilije Pušica, a fifth-year senior, is having a crucial impact for Northeastern. He’s excellent on the offensive end, a very dangerous player off the pick and roll or on the open court. What could be his ceiling, in your opinion? I believe that he will be a really good player in Europe. I can’t say at what level – EuroCup, or maybe Euroleague. 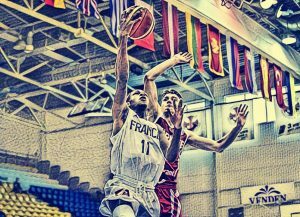 I think that’s his ceiling, to play at a very good level in Europe because he’s a guy who can play both guard positions, a true combo guard, on and off the ball. The thing with him is that he excels when he has a big role on his team, he’s not a guy who is going to play great if he’s like the 9th or the 10th in the rotation. He has been like that for his all career, even before moving to the US. The reason why he struggled in San Diego, apart from being an underclassman, is that he didn’t had that kind of flow. I think he made a perfect choice by transferring to Northeastern, a good mid-major team that is granting him exposure. There’s also an intriguing newcomer such as Mercer’s Djordje Dimitrijević: what can you tell us about him? He’s pretty similar to Pušica. He fell off the radar here in Serbia for a while but I’m seeing that he’s playing really well. He’s a smart player, one of those guys that can give you valuable minutes, that know when to dribble, shoot, try to drive, pass the ball outside. I’m curious to see what he will do next year, it will be crucial for his projection. His 3-point shooting is around the 25% but I think he’s a better shooter than his percentage suggests. Absolutely, there’s nothing wrong with his shot. His problem now lies mostly in the kind of shots he takes. Taking a closer look at his stats on Hoop-Math, it is possible to see that his percentage of assisted 3s is pretty low (a bit above 60%). He can make tough shots but this is affecting his efficiency now. There are so many guys playing at the mid-major level that it gets difficult to pick those we should talk about, after a certain point. We feel like that we have to at least name a couple of guys like Mladen Armuš, a big man who is definitely a great contributor – in more than one way – for East Tennessee State, and Stefan Kenić, a sophomore that has had a true impact at Cleveland State basically since day one. So if you have to choose one guy among those less “popular” ones, who would you pick? Andrija Ristanović of Iona is one guy that I think is under the radar, not only in terms of European scouting but also in Serbia as well. His path to college basketball has been a little bit more difficult because he played for a smaller team in Belgrade, then he went to North Central Texas Academy and finally to Hillcrest Prep. He’s much more interesting than what his stats would suggest because he’s a legit 6-10 guy with great technique, a very good player with the ball in his hands and a really, really good shooter. He’s a late bloomer, this is the reason way a lot of coaches and scouts here in Serbia didn’t pick up on him. But I also know, through his former coach, that he has great work ethic, he loves basketball and he’s great to work with. I think he’s the guy that will improve and surprise many people in the next year or two.